Most of what will happen in Daniel Fish’s Who Left the Fork Here (Baryshnikov Arts Center, Dec. 9-12) is obvious as soon as you enter the theater and an usher cautions you to “Please, don’t step on the cake.” An exploration (“adaptation” is too strong a word) of Three Sisters, the entire piece plays out like an extended riff on Chekhov’s gun. As soon as you see the various props arranged far down-stage, you know that sooner or later, cameras will be trained on performers to deliver live-feed, lighting instruments will be arranged throughout the space on the floor, and that those cakes (there’s more than a dozen) will eventually be smeared all over one of the three women who enact the piece. I haven’t seen all of Fish’s recent work, but Who Left the Fork Here certainly bears relation to some of his other work in what I can only call task-based performance. In A (radically condensed and expanded) Supposedly Fun Thing I’ll Never Do Again, which used the writings of David Foster Wallace, Fish live-mixed the performance by switching on and off audio channels to a diverse cast of performers. When they could hear the signal, they had to perform and deliver the text; when they couldn’t hear it, they stopped. The result was a choral rendition of Wallace’s spoken texts that both offered a provocative take on his writings but also on his own identity (since the audio was of Wallace himself speaking). Fish used a similar technique for House for Sale (this time using an essay by Jonathan Franzen), live-mixing his cast this time by activating and de-activating performers with colored lights. This task-based approach to creating performances gets a more radical application in Who Left the Fork Here. Fish dispenses almost entirely with Chekhov’s text except for a couple citations, and otherwise uses purely theatrical materials (most of which, aside from the cakes, have virtually no relation to the original play) to enact a exploration of the three titular characters’ identities and experiences. The first gesture of the performance is for Tina Benko (who, and I don’t want to be too literal about this, seems clearly based on Masha) to step onstage and begin a pattern-based exploration of space. One by one, she takes roughly three-foot squares of particle board off a rack and arranges them on the floor. After she’s tiled a three-square by three-square corner of the stage, she starts moving the boards from one side to the other, letting the tiled area crawl across and then down the stage, around and under obstacles like chairs and cables, until she’s at one point or another tiled the entire space. 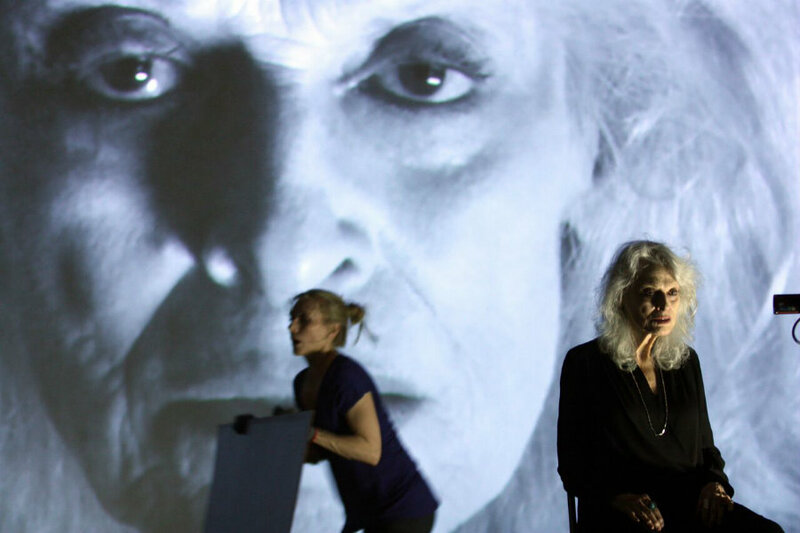 As Benko follows her process, Judith Roberts (who I’d peg as Olga, but again…) takes up her position at center stage, where a live-feed camera shoots her face in close-up, so that for most of the performance the audience watches her staring beatifically back out at them in a projection on the upstage wall. Last, Auden Thornton (Irina, again with caveat) walks to far stage-right, and begins walking upstage to the back wall and then back downstage until she encounters an obstacle. And that’s basically it. Thornton paces the same line, at varying speeds, throughout most of the performance. Roberts maintains her spot nearly to the end, though occasionally she’s permitted to shift her gaze from directly into the camera to some other event happening onstage. Benko is given the most complex tasks to complete. She makes a table of sorts with a piece of plywood and a pair of saw-horses, then cuts a hole out of the center of it with a reciprocating saw. That’s when the cakes come in. She carefully stacks a half-dozen of them so that the hole is entirely covered, then dons a sequined one-piece like she was a high-school baton twirler. Then—surprise!—she pops out of the pile of cake. Arms spread and eyes scanning the audience imploringly, she waits for several rounds of applause before using a half-dozen more cakes to replicate the entire enterprise. As these events unfold, designers Jim Findlay (video and sound) and Christopher Kuhl (lights)—who operate the show from tech tables upstage-left—take turns arranging cameras and lights around the stage as demanded by the events taking place. Behind the audience on the wall, a big red timer tracks how much time has passed to guide the performers (the show ended right around the 56-minute mark the night I saw it). There’s a few ways to make sense of the piece. Personally, I saw it primarily as exploration of divergent ways of reading Three Sisters in terms of gender. There’s the conventional way of interpreting Chekhov’s play. As with most of his work, Three Sisters seems almost caustic in how it portrays its characters as subject to their circumstances. All three sisters want something more than life is going to give them, and this conventional reading suggests that their unhappiness is primarily the result of their inability to take a hard-eyed look at their conditions and just accept them. Instead, their unrealistic hopes and dreams inspire them to commit acts (marriages and infidelities, mainly) in pursuit of other goals, which ultimately leave them unhappy. And gendered as these choices are in Three Sisters, this reading comes at the expense of any feminist interpretation. Which leads us to the second, feminist reading (and this is what I think Fish was aiming for). Fish had transformed their primary character traits—Olga the matronly “spinster,” Masha the artist with a need to entertain and attract attention, and the over-eager youngster Irina—into durational tasks to be performed. While the actors may be as subject as their original characters were to the whims of men (in this case, the guys who operate the show’s tech onstage), these roles—by being rendered as a form of labor—become active rather than passive. That seems to suggest that, rather than a tragic flaw depicting unreasonable expectations, the choices these women have made are expressions of personal agency. The outcome may have been a disappointment in Chekhov’s play, but seeing them as a matter of taking life by the horns rather than damaging flights of fancy lets their experiences become heroic. The use of live-feed video onstage furthers this sort of reading. You can’t stare into Roberts’s intense gaze projected on the back wall (let alone the closing scenes with Benko) for more than a few minutes before Laura Mulvey’s critique of cinema and the Male Gaze starts popping into your mind. Indeed, I suspect this show would be conducive to a close reading of how the video alone is employed in a dynamic of looking and being seen, objectivity and subjectivity, and so on. Certainly a more extensive one than I intend to offer, but which nevertheless speaks to the technical accomplishment of the artists. With that said, I couldn’t help but being troubled by the show’s use of gender at the same time. While Who Left This Fork Here can certainly be read in these feminist terms (I’d say it even wants to be), it’s still inescapably the work of a male director. Watching Thornton’s exhausting performance (which struck me as too cliché; Chekhov’s gun notwithstanding, I’ve seen way too many performances in which someone performs a physically exhausting, repetitive task in order to deliver a line out-of-breath) reminds you that this task, the challenge of which is evoked in her breathing and movement—imposed on her body, in other words—is dictated by a male. Likewise, I was struck by how beautiful Roberts was rendered onscreen. The press material has made much of the fact that these three performers’ ages span some seven decades, and the upper end of that is occupied by Roberts. But with her face blown-up across the back wall, I felt like she was likely cast just because she was so photogenic. The camera at once captured the lines and wrinkles that speak to age and experience, but also captured her almost ethereal beauty. If you looked up the old euphemism about “aging gracefully” in a dictionary, she could be an illustration. All of which leaves me somewhat ambivalent. As powerful and striking as the performance was, in the end I couldn’t help but feel that it was using women’s bodies as material in a performance to the exclusion of their subjectivity, even as I wanted to read the choices as being about the original characters’ subjectivity. And the fact that the women so rarely speak in this performance also inherently ties back (whether Fish intended to or not) to a long discourse about the politics of who gets to speak onstage, of who is granted a voice. I don’t know what a Bechdel Test for non-textual inter-disciplinary performance would look like, but instinctively I feel like this piece would have failed it. Or perhaps I’m completely wrong (it wouldn’t be the first time). I was provoked and a little baffled by the claim in promotional materials that this piece was also about “Big Data,” which I can only make sense by taking some big conceptual leaps. But there you have it: It could also just as well be about the Internet.